TIRED OF BEING SWAMPED BY HIGH SHIPPING PRICES? NEW FEATURES - 8-16hp LONG TAIL KIT - Includes right hand AND left hand tiller option, additional roller bearing in PTO housing and new engine motor balance adjustment! Redesigned 4" Deep Transom Mount Clamp with hardened "T" Style Wing Bolts. Also, see our Transom Pad Kit! 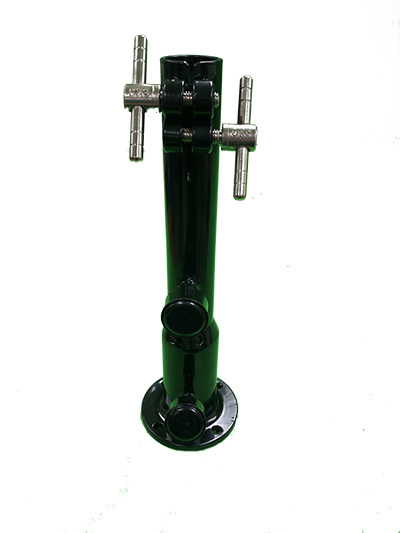 Adjustable Tiller Handle - Now Powder coated black! 2 Propellers - 7.5" & 8.5" Diameter. The four bolt holes fit most engine bases from 8 to 16hp. Right hand and left hand steering option. Engine balance adjustment allows engine movement on the base for fine tuning your kit! The PTO fits over the Engine Shaft and the Drive Shaft slots into it. 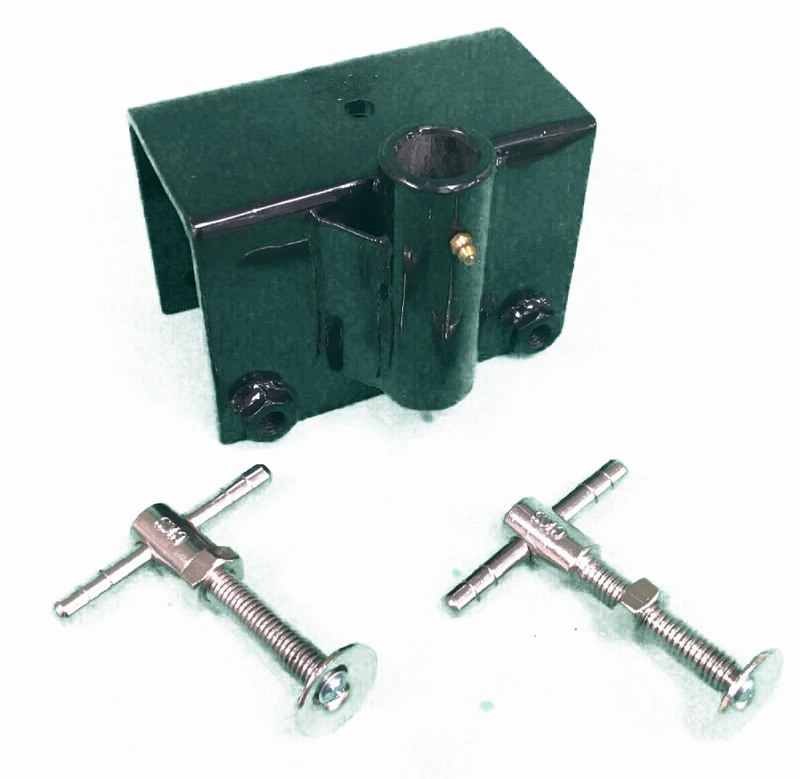 Includes both screw and key mechanisms to lock into place. The housing is bolted over the engine's drive shaft. Includes NEW roller bearing. Engine Mounting Bolt Holes - 3.75" x 7.6875"
Engine PTO - 1' Diameter Horizontal Keyed Shaft - Please select which size PTO at checkout! Clint F -- "I want to say I'm glad I didn't believe the hype and go with the s*s company although I'm from Florida, now in Texas. I purchased your longtail 7 hp kit and although I customized it it's awesome. No one has ever seen the like round here. I'm a commercial fisherman and I use this motor to collect and sell marsh baits. Thank you mudskipper for saving me $$$." Jeff C - "Just purchased your long tail mud motor and love it. I will be ordering the z bent steering arm for it soon. I stand while operating the boat and it will make the motor complete. Thanks again guys good job"
If, within TWO years from the date of purchase your longtail mud-motor kit fails due to a defect in materials, or workmanship, we will repair or replace, at our discretion, any part that we determine to be defective in materials or workmanship, free of charge. If the product fails, the buyer must contact Mud-Skipper for an RMA prior to returning the product. Failed parts must be returned for inspection. Shipping expenses for any item submitted for repair or replacement under this warranty are the responsibility of the owner of the item. Mud-Skipper will provide return shipping of the repaired or replaced part to the customer via UPS, USPS parcel post, or other freight carrier of our choice (additional charges for expedited return shipping to the buyer is the responsibility of the buyer). This warranty does not cover damage due to impact, normal wear, excessive wear to the shaft or shaft bushings due to lack of lubrication, neglect, corrosion, lack of maintenance, modification to the product, or misuse. The customer will be responsible for the shipping costs of any item returned to them that is not covered under warranty. This warranty is provided to the original purchaser. Proof of original purchase is required on all warranties, exchanges, and returns. Electrical parts ARE covered under this warranty. Propellers ARE NOT covered under this warranty.